So you’ve finished the latest draft of the epistle you’ve been slaving over for longer than you care to admit. Maybe it’s a short story, or a novel or screenplay, doesn’t matter – it’s the baby you’ve been nursing along. And now you’ve gotten feedback. Of course it included some positive comments, that’s de rigueur for a critique. You might have heard the piece had a strong voice, great descriptions, likeable characters, interesting topic, a fresh story. But what to do with the conflicting criticisms? One reader wanted more mystery and suspense. Another wanted more drama and romance while someone else thought the love angle was gratuitous and a third was disappointed you didn’t elaborate on the bedroom scene. Everybody commented about too much detail here, it dragged in the middle and the ending was rushed. The pickiest reader said the motivations didn’t jive with the characters. Where to now, Kemo Sabe? 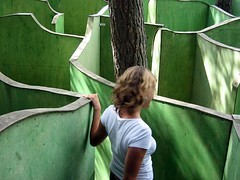 You may be the leader of the party, but the combined critiques are like a maze and you’re not sure which way to turn to work your way through to the end. Do you put the piece in the freezer and think, “I’ll come back to it later?” Or, just ditch the whole thing and chalk it up to a learning experience? The only way to answer those questions is whether the story hangs on. If it haunts you, follows you around at the grocery story, wakes you in the night, then it’s better to plow through. So how to restart, refocus and re-energized, you ask? 1. Go back to the germ that sparked the story. What did you want to say, and why? That’s how to decide if it’s a mystery, thriller, drama, or romance. Let the seed take root, grounding you in the genre and don’t be afraid to prune the sappers that compete with the core theme. 2. Decide whose story it is. Reconnect with the main characters. They can free you from worrying about what’s got to happen to move the plot along. You know what you want to say, but you don’t have to know what will happen to get the message across. The characters can lead you to the plot points, if you let them. 3. Read the first page carefully. Does it echo back to the kernel? Does the essence of your character make contact with the reader in the first paragraph? Don’t move on until you can see the story and the characters clearly in the first chapter. If you can’t get it there, then pick a place where the character’s voice resonates. That’s your best starting point. 4. Allow yourself the luxury of falling in love again, with the message, with the characters, and with the process. Slow down, take your time, and don’t rush to the ending. You’ve got a life time because writing has no retirement date, no expirations, and no cancellations. It’s got the longest shelf life of any avocation or hobby, whichever way you choose to define it. The pleasure of writing is in the process, not the product. So relax and enjoy it. And, remember, it’s always the first draft, not matter how many times you’ve written it.